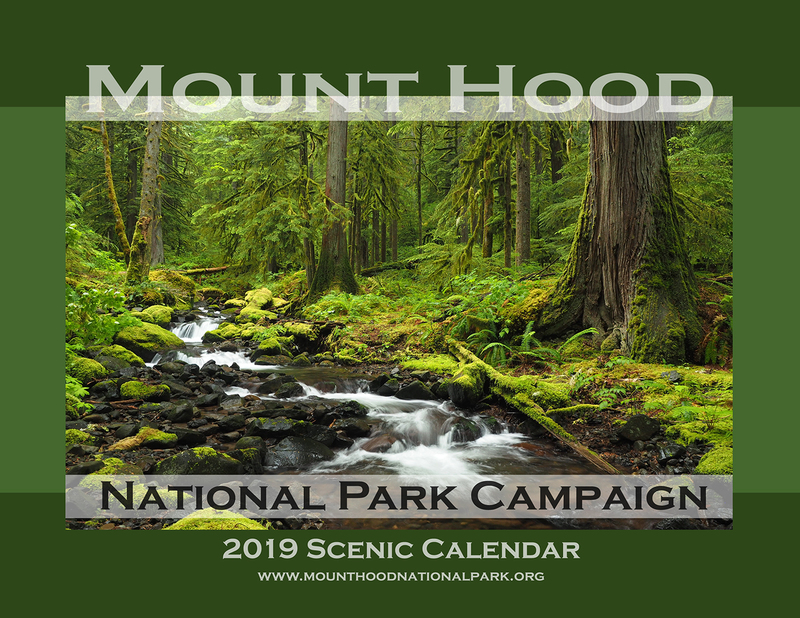 For the past many years, one of my morning rituals has been to check on the Forest Service air quality cameras located above Timberline Lodge on Mount Hood and in the eastern Columbia River Gorge, near Wishram, Washington. 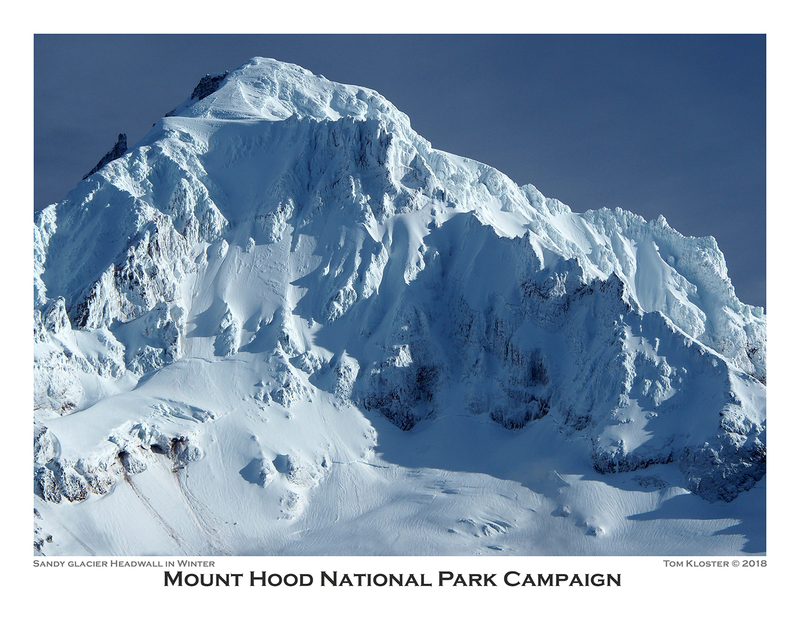 The Hood came was pointed south, toward Mount Jefferson and the Gorge cam was pointed west, toward Mount Hood. I use past tense to describe these cameras because they were abruptly turned off toward the end of the latest shutdown of the federal government. This article focuses on why these cameras were important, why they might have been shut down and why they should be brought back on line. 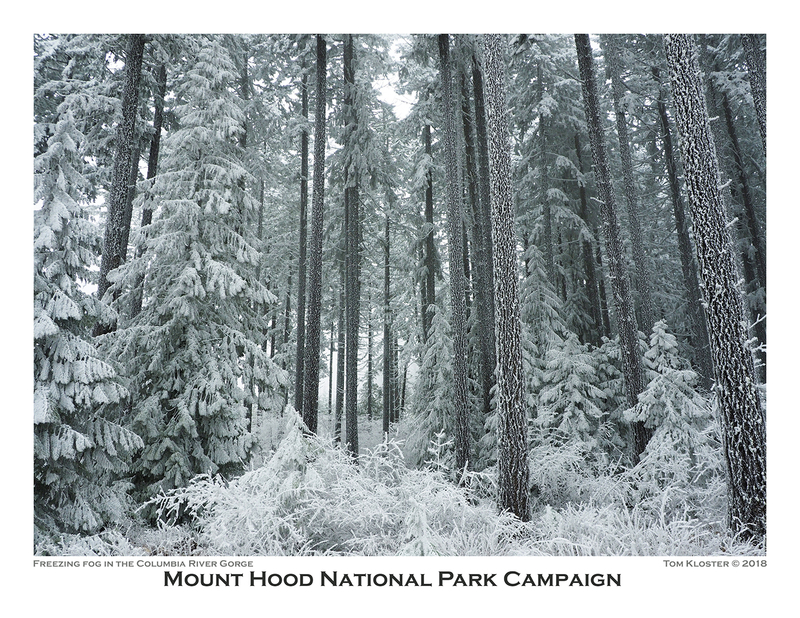 Like many federal agencies, the Forest Service has maintained an air quality monitoring program for decades in response to the Clean Air Act. Most famously, this includes measuring the acid rain falling on public forests as a result of urban air pollution, a phenomenon that was first documented in eastern forests in the 1970s and 80s. In Oregon, the Forest Service air quality program came to the forefront more recently, when their monitoring of lichens for trace pollutants helped alert state authorities to toxic levels of emissions coming from a glass factory in Portland. 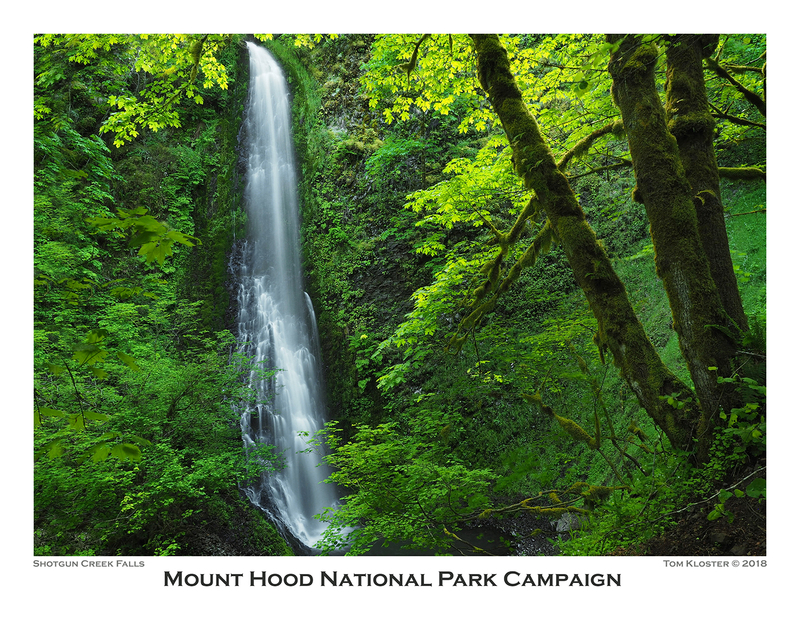 The wilderness webcams help the Forest Service measure air pollution in places like Mount Hood and the Columbia River Gorge that are in close proximity to major urban areas and vulnerable to growing air toxics and particulate pollution. 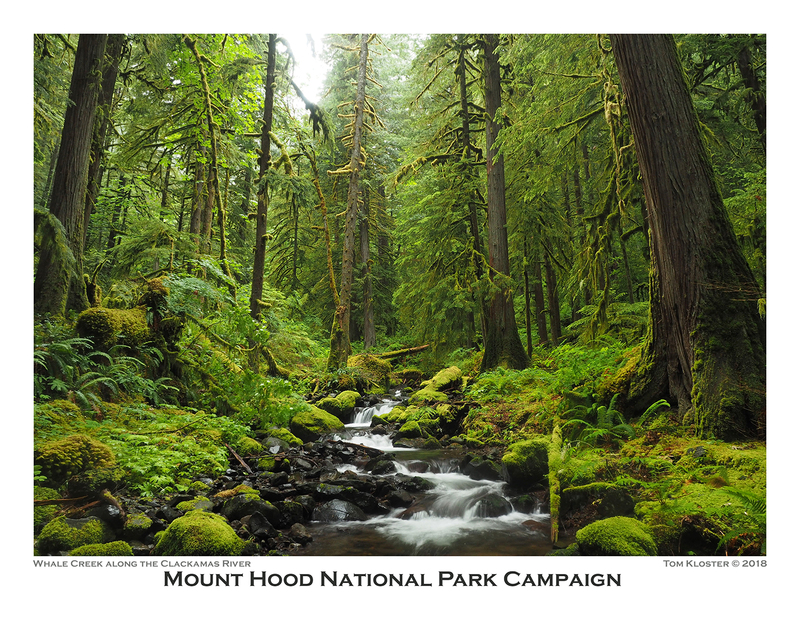 Under this program, not all Forest Service lands are created equal. Areas defined as “Class I” by the agency are of critical concern and the Forest Service has been tasked with establishing targets to help monitor and potentially regulate pollution “loads” for these areas. 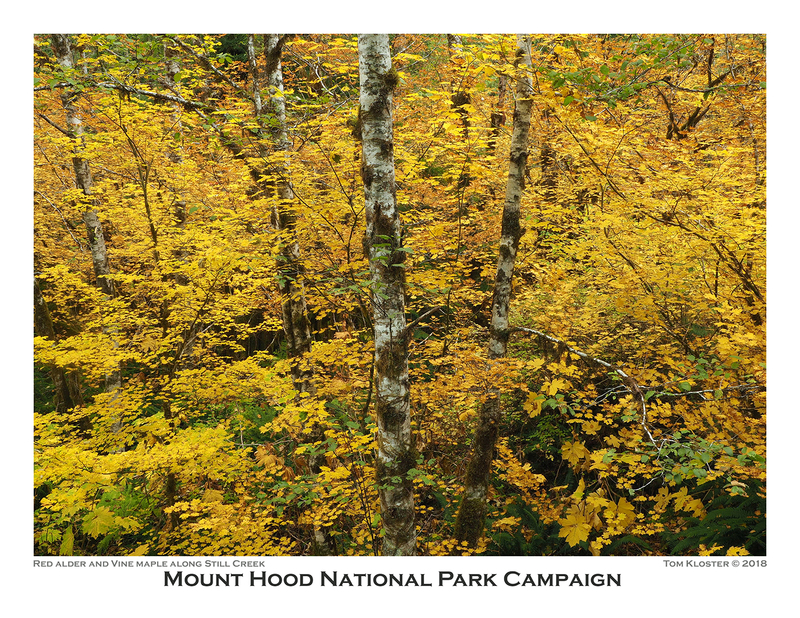 The targets are based on levels of pollution that measurably impact wilderness ecosystems. 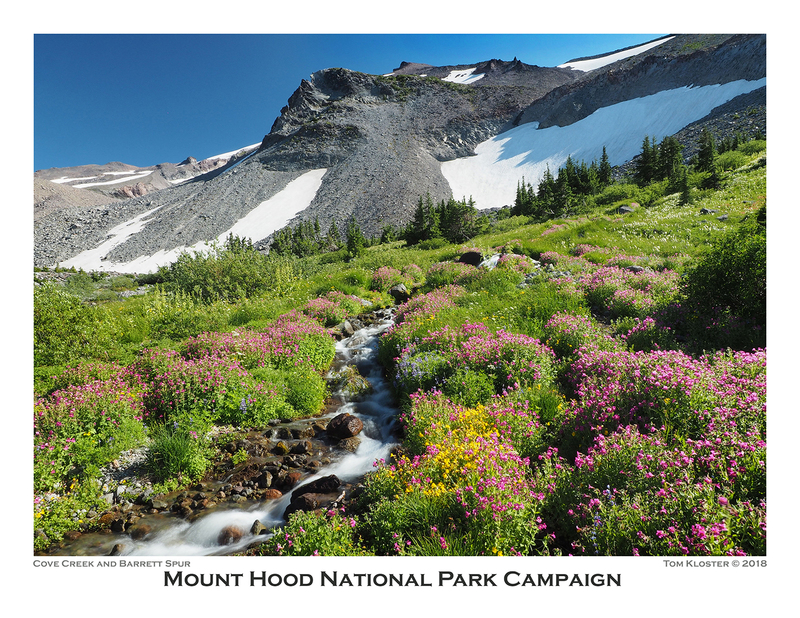 The Mount Hood Wilderness and Mount Jefferson Wilderness are among the Class I areas in Oregon, as is the Columbia River Gorge National Scenic Area. The end of the Forest Service Wilderness Webcams..? The webcams went offline toward the end of the most recent federal government shutdown, when a deal to reopen the government was in sight, which didn’t make sense from a funding or resource argument. This took me back to a more nefarious objective: perhaps the shutdown was a simply a convenient time to kill off the air quality program, when few would notice? There’s reason for alarm, too. While the webcams are a handy (and often inspiring!) resource for the general public, they also represent a threat to the polluters who are now in league with the Trump administration in their assault on environmental protections. They provide ongoing, measurable documentation on the state of the environment, without which protections can’t really be enacted or enforced. The webcams are also increasingly important to the Portland region, as we learned during the 2017 Eagle Creek Fire. While scientists are still debating the potential ecological value of forest fire smoke in late summer (some believe it provides an important cooling effect during the last weeks of our annual drought), the public health effects on humans are decidedly hazardous. Most forest ecologists believe we have entered a new era of catastrophic fires that will make heavy smoke the norm in Oregon and across the west for decades to come. The webcams not only provide ongoing monitoring of these effects for scientists, they also help the public see (and avoid) the forests when smoke has reached unhealthy levels. I reached out to the Forest Service with these questions and received a prompt response and a few answers. The agency position is that a tight Forest Service budget is forcing tough decisions, especially for programs involving field equipment that require ongoing operations and maintenance. This explanation aligns with the well-documented reality that a larger and growing share of the USFS budget is channeled into forest fire response each summer, draining other programs of funds. More concerning in the response is that the decision to shut down the wilderness webcams was apparently made at Forest Service headquarters in Washington, D.C., where a single government contractor had maintained the national network of cameras. Putting nefarious influences aside (including the dubious motives of former Georgia Governor Sunny Perdue, who unfortunately serves as Secretary of Agriculture and thus is also overseeing the Forest Service), it’s also true that the entire agency has experienced declining funding for basic programs over the past several years because of ballooning forest fire costs and the ongoing dysfunction of Congress and its inability to actually pass a budget. On a more encouraging note, the Forest Service response did suggest that local forests may adopt the wilderness webcams and operate them on a regional level, noting that the agency was “well aware of the importance of the cameras.” That’s good news, and hopefully, this will come to pass. While this blog exists to challenge the historic mission of extraction and exploitation by the USFS, the scientists within the organization have long been the conscience of the agency. They have helped gradually steer the agency toward a more sustainable mission, albeit confounded by ongoing Congressional and White House mandates for more logging and less environmental protection. Cutbacks to tiny programs like air quality monitoring are just another reminder of the conflicted and unsustainable mission the Forest Service has been tasked with, and where science ranks in the political pecking order. In the meantime, more Gorge Cam memories… and action? While we wait to learn the fate of the wilderness webcams, here are some images to enjoy from the Gorge webcam that I downloaded in September 2016. 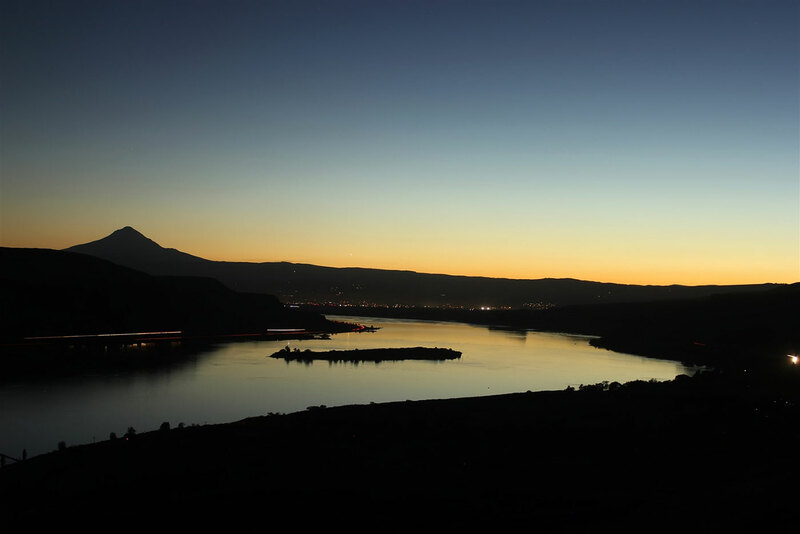 Perhaps my favorite in this series is this remarkably peaceful twilight scene that includes an unusually calm Columbia River reflecting the sky. 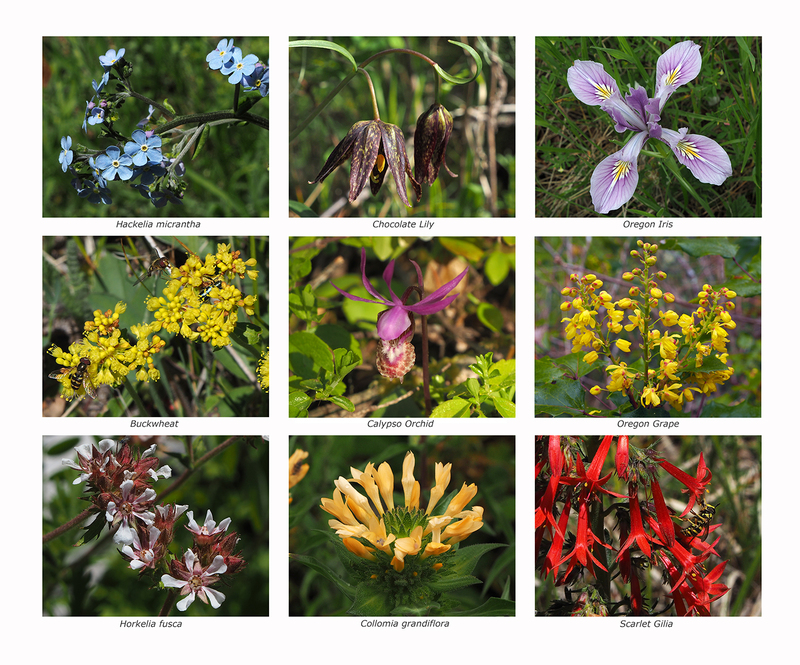 The linked larger version (below) gives a sense of the quality of images that have been gathered from the wilderness cams over the years — large version of all images have been archived in high definition for scientists to use in research… until now, that is. This September 7, 2016 evening view from the Gorge webcam shows a series of lenticular clouds forming over Mount Hood on a late summer evening, a surprisingly common phenomenon when Pacific storms are approaching that is often masked by clouds (visible low on the horizon) for Portlanders on the west side of the mountain. This subtle scene (below) not only captures the late evening mood of the Gorge as high clouds from a new storm are approaching, it also captures distant lights in The Dalles and beyond that help scientists monitor particulate pollution. Hopefully, we’ll have more scenes like these to follow in the future. But in the meantime, what can we do to bring back the wilderness webcams and defend the Forest Service air quality program? It’s always worth calling our U.S. Senators and congressional delegation, especially if you’re concerned about the broader hostility the Trump administration shown toward public lands and environmental protection. With the U.S. House back in an oversight role this year, the Democrats in the Oregon delegation are once again powerful allies in pushing back on the Trump agenda. Please take a moment to weigh in! The giant boulder at the camp entrance is hard to miss! Earlier this year, I attended a Trailkeepers of Oregon (TKO) event at Camp Arrah Wanna, a venerable youth camp located in the deep forests along the Salmon River, west of Mount Hood. The camp’s origins are a bit hazy, but today’s youth camp emerged from the Arrah Wanna Inn, one of many roadside hotels and restaurants that lined the Mount Hood Loop Highway soon after it opened in the early 1920s. 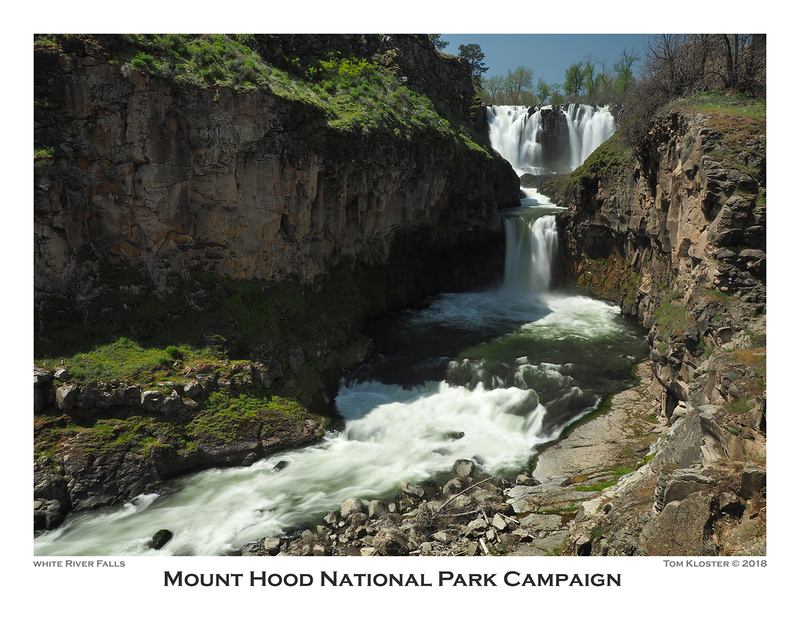 During the heyday of the Arrah Wanna Inn, travelers explored the area in a growing network of trails to nearby forest lookouts and along the Salmon River. Locals also served as fishing and horseback tour guides to the growing stream of auto tourists. Today, the camp hosts outdoor school each spring, faith-based youth camps in summer and winter and many other private retreats and events over the course of the year. Today’s main lodge at the camp is housed in the historic Arrah Wanna Inn building. And though it has been decades since I spent my summers in high school and college working at camp, walking into the dining room in the main lodge brought back a flood of great memories. 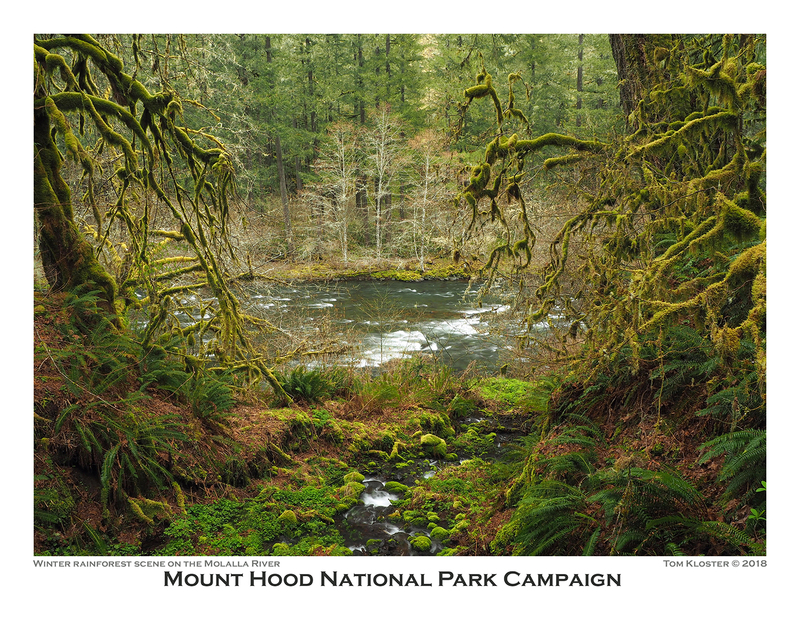 Walking through the old dining room, something hanging above the east fireplace caught my eye: a huge watercolor panorama of the surrounding Mount Hood country! Panoramic, hand-tinted photos and paintings of Mount Hood were popular in the early 1900s, but this was different. This painting was intended so have some geographic accuracy, and is clearly a custom original. The frame and age of painting suggest that it was originally done for the Arrah Wanna Inn, and simply came with the building when Camp Arrah Wanna was established. The artist behind this beautiful painting is unknown, though there may be a signature hidden inside the frame or on the back of the painting. The rest of this article is a tour of the details in this amazing, little known painting, section by section. Front and center in the painting is the Welches community, known today as the Resort at the Mountain. Mount Adams appears on the horizon in this view, which is geographically correct. The large butte in front of Mount Adams in a mystery, however. My guess is that it reflects Hickman Butte, locked away behind the gates that close the Bull Run watershed to the public today, but the site of a prominent forest lookout in the 1920s, when I think this painting was made. Looking more closely at the details in the Welches area, you can clearly see the Arrah Wanna Inn, which is why I believe this was created for the Inn as a custom artwork. In the foreground of the painting, a horseback party has arrived at a viewpoint overlooking the Salmon and Sandy River valleys (below). 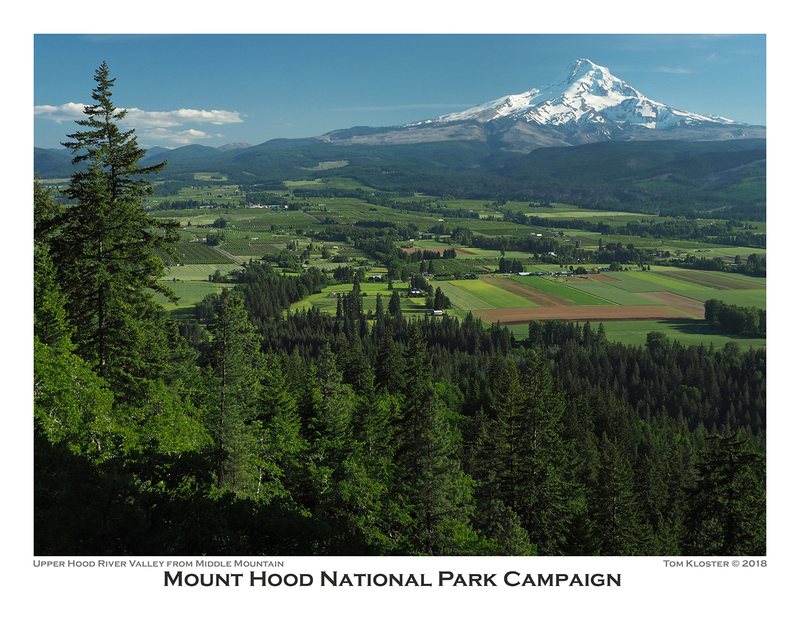 The artist has used some license here to place both Mount Adams and Welches in view, but in reality Mount Adams can only be seen from the upper part of Huckleberry Mountain. The long-unmaintained Arrah Wanna Trail did climb directly to Huckleberry Mountain, and there were viewpoints of the the valleys from sections of this old trail, so I think the artist simply merged these perspectives. It’s hard to see, but the image shows a man leading five women and two horses to this viewpoint, with a second man bringing up the rear. We can only guess on the significance of the group — is it a biographical detail of the artist, perhaps? We’ll probably never know. Also visible in this close-up look at the painting (below) is the Samuel Welch homestead and pasture that gave the community its name. The pasture was once known as “Billy’s Goat Pasture”, after Samual Welch’s son William, and today has been converted to be part of the golf course at the Inn at the Mountain. Moving to the upper left corner of the painting (below), the artist included remarkable detail of Portland and the farm towns like Gresham, Powell Valley, Troutdale and Sandy that have since become suburbs. 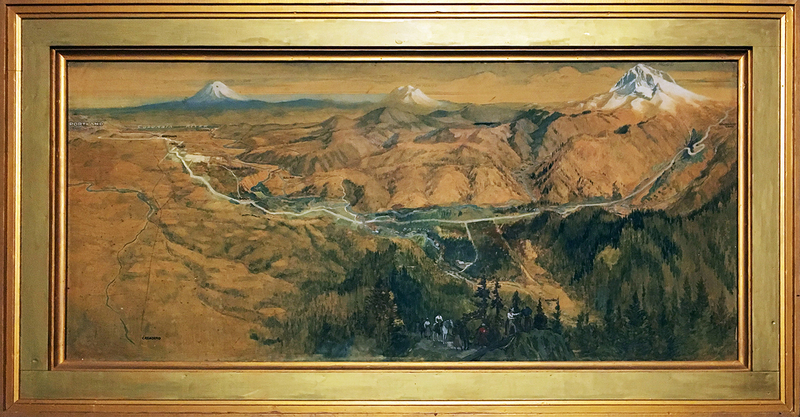 Look closely, and you can see that the artist has carefully included Mount Scott, Kelley Butte, Mount Tabor and Rocky Butte in the painting details, as well as the Clackamas River, Cazadero interurban rail line, Columbia River and once-perfect cone of Mount St. Helens on the horizon. These details show the artist to be a person with excellent knowledge of the area, since several of these features are in gegrpahically correct, but not actually visible from Huckleberry Mountain without floating a couple thousand feet above the summit. 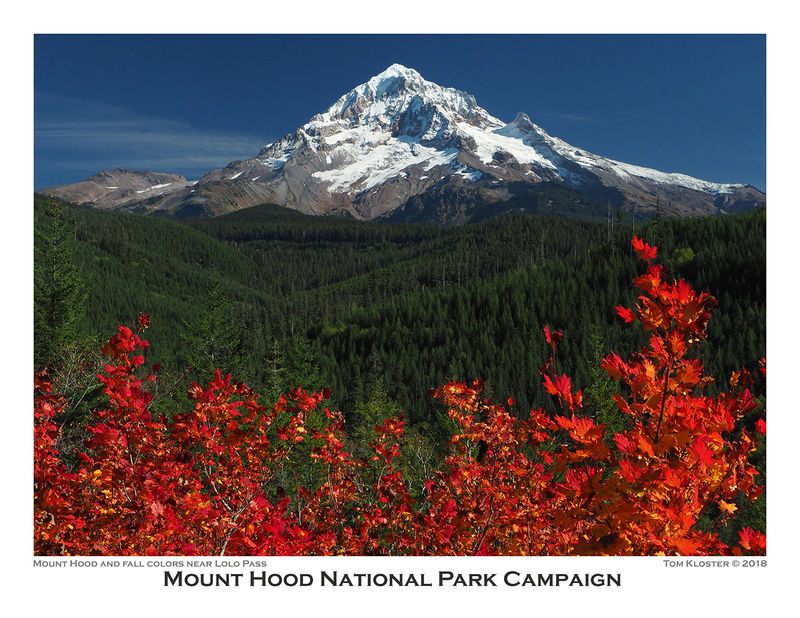 Moving to the right side of the painting, the artist has rendered a beautiful and very accurate portrait of Mount Hood (below). Zigzag Mountain — the long ridge in front of the mountain — is correctly shown as burned over. Lookout photos from the 1930s confirm that nearly all of this ridge burned in the early 1900s, though forests have largely returned today. A closer look (below) shows the confluence of the Zigzag and Sandy Rivers at today’s Zigzag community. The gray coloring along the Sandy River (approaching from the top) is also accurate to the period. In the early 1900s, the devastation from the Old Maid Flat eruptions of the late 1700s were still on display, as early photos show. Though mostly forested now, the valley floor was still a mostly open plain of cobbles and volcanic debris when the painting was created. There’s another example of artistic license in this part of the painting, too. The large lake in the distance (below) appears to be Bull Run Lake, with Buck Peak rising behind it. The lake is completely hidden from the vantage point for the painting by intervening peaks and ridges. I had to “fly” to over 18,000 feet — almost 3 vertical miles — above Huckleberry Mountain to actually see Bull Run Lake from this perspective. But the artist’s license in showing this detail is also another example of great knowledge of the area landscape, as the position of the lake is geographically correct. That’s a real feat in an era when only a few, small-scale topographic maps of the region existed! 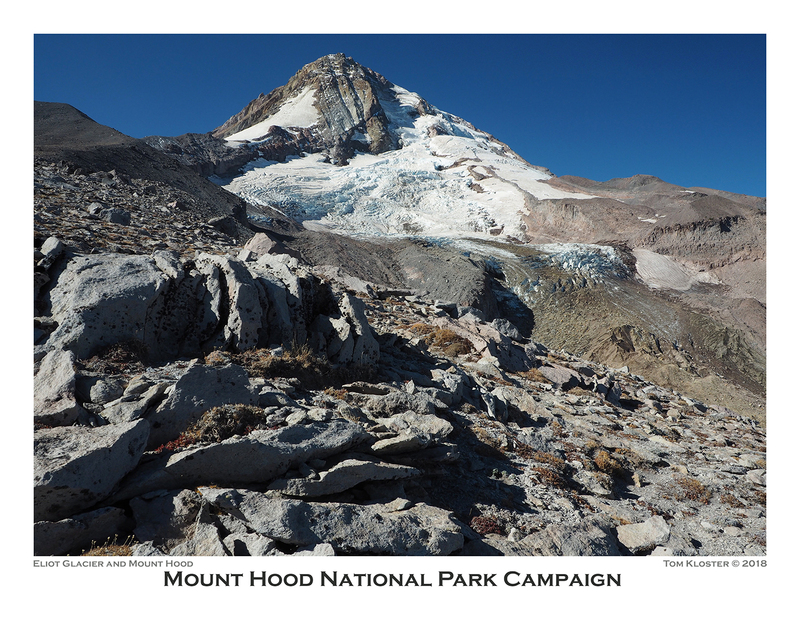 Looking more closely at Mount Hood and the loop highway where it climbs through the Zigzag Valley and up Laurel Hill to Government Camp (below) shows more terrific details. 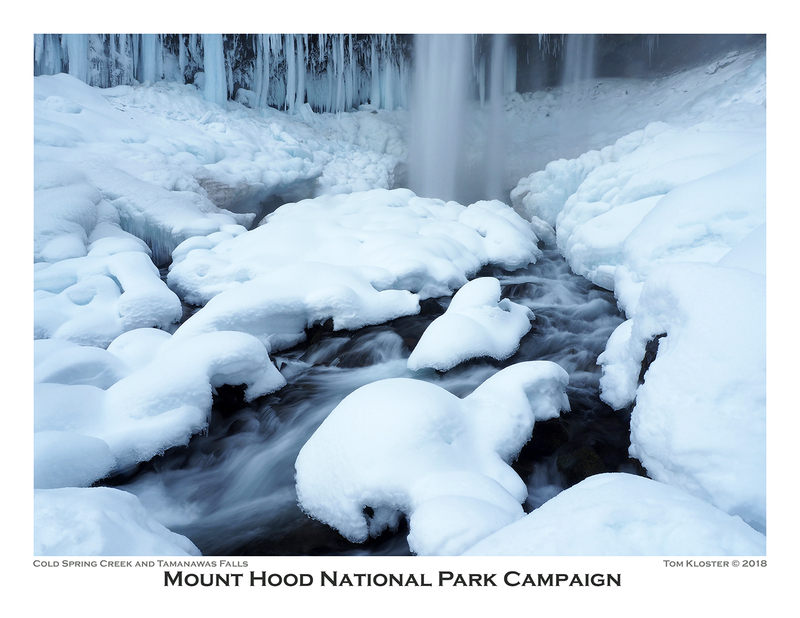 On the mountain, major features like Steel Cliff, Illumination Rock, Reid Glacier and Yocum Ridge are all included and proportionally accurate, with a bit of artistic license. If you look very closely, you can even pick out Cathedral Ridge, McNeil Point and Barrett Spur, all of which are geographically accurate from the vantage point of Huckleberry Mountain. Looking very closely at Laurel Hill and the highway approach to Government Camp (below), the old loops on the historic highway are shown in great detail, along with the Little Zigzag River at the first highway switchback and Yocum Falls on Camp Creek to the right of the third switchback. The burn details are also correct, here, as most of the area around Government Camp had burned and was just beginning to recover in the early 1900s. The kind staff at Camp Arrah Wanna allowed me to share these images, and hopefully they will satisfy your curiosity, as well. The camp is a non-profit operation, and not really equipped to handle tourists dropping by to admire old paintings! But if you or an organization you belong to is looking for a site for a retreat or gather, consider supporting Camp Arrah Wanna! It’s one of the real gems on the old highway circuit, and relies on event bookings to keep this beautiful slice of history alive. I’m also able to share even higher resolution images of the painting than what I posted for this article. Please reach out to me if you’re interested.